Create a backup image of hard disk drive (HDD) or SSD so that you can restore it at a later time in case of system crash, disk failure or disaster. You store data on a hard disk or a specific partition. To prevent them from losing, It’s advisable for you to take a double insurance and that is to backup them! There are multiple partitions on the hard disk of a laptop including the system partition, System reserved partition, data partitions and for some manufacturers such as Lenovo, they even create a OneKey recovery partition on their products. To backup such many partitions one by one is really troublesome. In this case, you could just make a backup image of the entire hard drive instead of backing up all the partitions on that disk. If something bad such as the malfunction of the OneKey Recovery and system boot failure happen on the laptop one day, you can still recover the entire hard disk by using the prepared backup image. 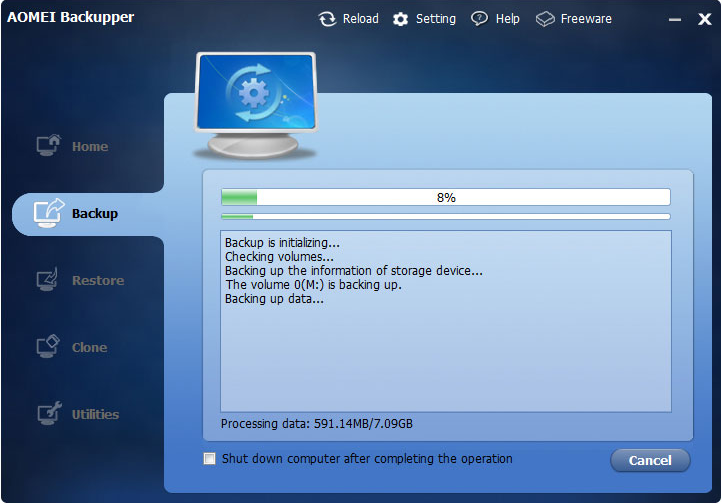 It’s like purchasing a double insurance for your laptop by using the backup and restore function in AOMEI Backupper. 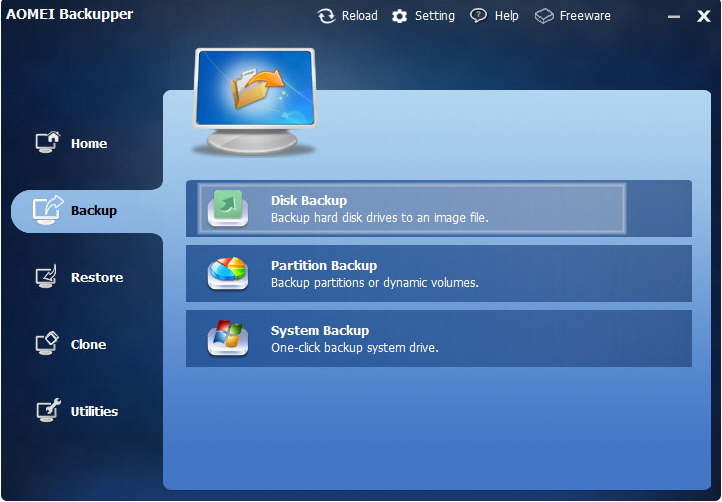 AOMEI Backupper software supports both disk backup and partition backup. You can back up the entire disk or some partitions according to your specific needs. Thus makes the backup operation more flexible. Step1. 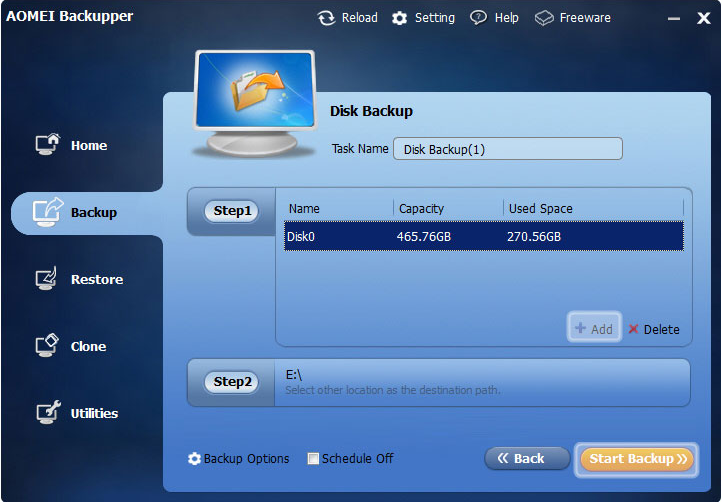 Launch this FREE disk backup software: AOMEI Backupper and click on Backup at the left side of the main interface. Then choose Disk Backup button. Step2. Click on Add button to choose the source disk that you want to backup and add it into this list, then specify a destination path for storing the disk backup image. There are many options available in AOMEI Backupper for the destination path, such as an external hard drive and NAS devices. Step3. Click on Start Backup button. Then you will see the interface below which indicates that the disk backup is in progress. You can find the image in the destination folder once the backup process is over. Thus if some problems occur to the hard drive in the future, you can use this very image file to restore them to the normal state. Still have some questions after reading this article? You may click on the link below to learn more of the detailed instructions. When something unfavorable occurs, how to recover it with AOMEI Backupper? You may open the link below to learn more.